Being a gangster involves lots back street and underhand activities. Street Crime mimics this by allowing players to own and gamble at casino tables. There are 6 types of casino available to own and play within Street Crime. 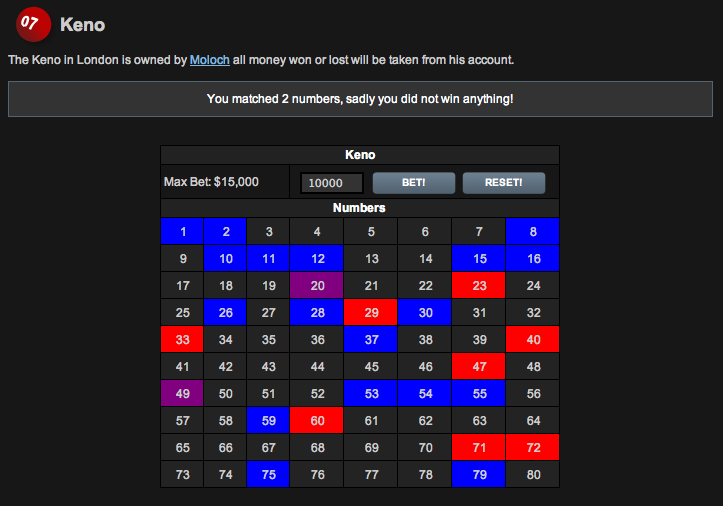 See the right panel for the casino types available. Within Street Crime there is currently 8 different cities across the world including London, Bogota and Las Vegas. Each of these cities has a casino of each type. The owner of the casino sets the maximum bet for the casino, you as a player can gamble up to this amount. Think you can play the owner broke? Can I win a Casino? Of course, if you gamble at a gangsters casino table and they no longer have enough cash to pay out your winnings they automatically drop the casino. This therefore gives you the opportunity to own the casino. You can now set the maximum bet and see your profits. Think you have what it takes to be a casino owner? Many gangsters never learn when to stop gambling. Do you want to make a quick buck and run? or do you want to take the owner to the cleaners? These are the decisions you need to answer yourself, get stuck in now! Street Crime is always adding to the casino games available. Keep up to date for any new games. See yourself as a casino owner? Signup today!